The Toyota Prius Plug-in Hybrid will cost less than £31,000 when it goes on sale in the first half of 2012. Government sales incentives are not deducted, so the price customers pay could be as much as £5,000 less than that. The pricing places it close to pure EVs like the Nissan Leaf, but thanks to the plug-in hybrid design the Prius will have a greater range than pure electric rivals. In EV mode the Prius Plug-in can cover around 14 miles, using nothing other than the electricity from its batteries, which can be charged from the mains in an hour and a half. Should the driver need to travel further, the 1.8-litre petrol engine will kick in and the car will behave like a regular, full-hybrid Prius. That means longer journeys needn’t be an issue. Toyota predicts combine cycle fuel economy of 134.5mpg and emissions of 49g/km, although the official tests are yet to be carried out. That means zero road tax and congestion charge exemption for private buyers, and a low 5% BIK rate for company car drivers. 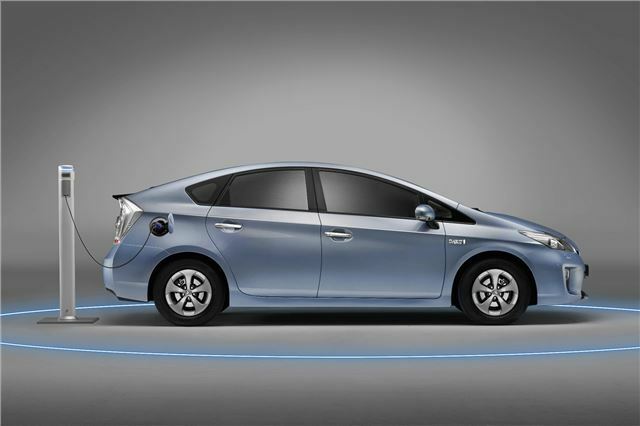 The Prius Plug-in will go on sale in the first half of 2012.